I fidgeted inside a Continental Airlines 707 in Okinawa waiting for the B-52s lined up on the flight line to take off. I glanced at the tattered and dog-eared pages of a Max Brand book I’d been trying to read for months about a buckaroo named Destry. Then I peered around at the others on the flight, all of them Marines (other than the crew), none of whom I knew. I looked out the port hole and studied the B-52s again. Their dark fuselages ginned-up images of hell, avengers and the Four Horsemen of the Apocalypse. When the B-52s finally rolled forward, their long wings drooped and prompted metaphors of sharp-taloned hawks. And then we were airborne, over the Pacific, headed for home, my thoughts saturated with scenes and noises and stenches of the battlefield. And even though I tried to read about Destry, nothing else managed to crowd into my mind except memories of Khe Sanh. We flew over Iwo Jima. It looked like a distorted version of a figure eight and I wondered about all those men who had died over that little piece of volcanic rock. 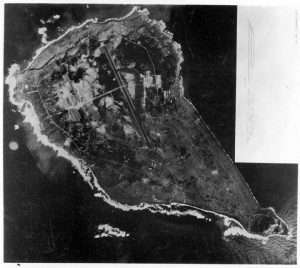 Iwo Jima from the air. At El Toro Marine Corps Air Station, we deplaned. I wanted to drop down, do a pushup and kiss the deck, but I didn’t. We put up with Marine Corps hassle as we processed to go on leave and then board a bus to LA and the airport. After I got my airline ticket to Tucson, I called home, trying to tell someone that I needed a ride, but no one answered. I finally contacted the mother of my best friend who told me she’d make sure someone showed up to get me. I waited in the airport lounge, smoking Camels and drinking real beer—Coors beer—wanting someone to say something about me being home, being alive, being a Vietnam vet who’d sacrificed for his county. Nobody said a damned thing except the bartender who muttered “thanks” when I left him a tip. On the flight to Tucson, I sat next to a girl who seemed about my age. She wouldn’t look at me. I could have struck up a conversation but I didn’t know what to talk about. I didn’t think she’d care about 152mm artillery rounds that shook the ground, severed arms and legs, and if they landed too close to you, forced blood out of the pores of your body. At Tucson, my parents met me as I headed down a set of stairs to baggage claim where my best friend and his fiancé waited. I could tell by the way they all stared at me that I wasn’t quite the person they’d expected. We went to a well-known Mexican food restaurant in Old Town. I craved green chili. After we sat, I ordered a Coke. I wanted a beer but didn’t think my mother would approve. Our meals arrived and I talked about Khe Sanh, what I saw, how I felt. They didn’t look at me, just turned to on their ground beef tacos, their green chili and queso enchiladas. 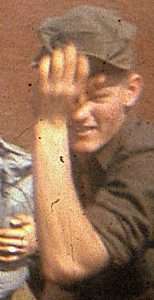 For decades after, when thinking about that moment, the top of my father’s balding head would invade my mind. It was what they showed me as they ate: the tops of their heads. Blogger Kn Rodgers at Khe Sanh in 1968. Photo courtesy of Michael E. O’Hara. At the time, I thought nobody was interested in what happened and maybe, in general, that was the attitude of a lot of Americans; they didn’t want to have to consider the particulars of death and carnage. But now, I think, my family and friends just didn’t know how to respond to what I described, since the Siege inhabited a universe too far outside the ken of their experience. So, I just shut up. By myself in the back seat of my parents’ Buick, riding through the black Sonoran Desert night, I looked out the window and thought about Khe Sanh, the siege, the dead, my fear, the memories of which I naively imagined would just slip away.